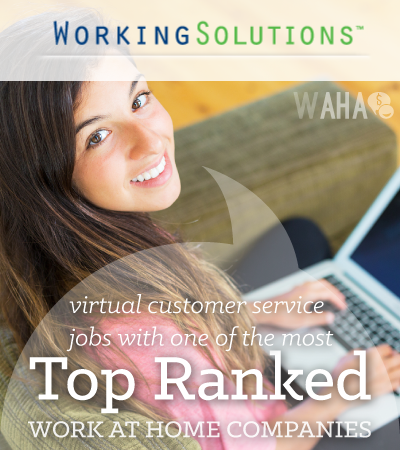 If you are looking for legitimate work-at-home opportunities, check out Working Solutions. Agents of Working Solutions work directly with customers via telephone, online chat sessions and/or email. This is a highly respected and well-known work at home company. This customer service based business has been providing virtual work to remote agents for over ten years. Working Solutions has a reputation for being a company that holds a high-level of respect for their agents. The company offers a variety of work from home jobs for a big list of top brands. To become an agent for Working Solutions, you will be required to complete an online application. There are no fees to apply or work for Working Solutions. Step 2: Your test results will be reviewed by Working Solutions. Step 3: Once you pass the assessments, you will be invited to a one-on-one phone interview. Step 4: Schedule your interview. Step 5: Once you pass the interview you will have agent status. Standard benefits such as health insurance are not offered. However, agents are offered many Agent Community Perks. These may include things such as discounts from major computer retailers. Working Solutions Agents are Independent Contractors. You work on a contract basis. Scheduling at Working Solutions is very flexible. Agents pick their own work hours. You are responsible for the hours you schedule. Meeting requirements and performing well on your programs will allow you to receive priority scheduling. There may be minimum hours you must meet per your contract and will depend on the program you work under. All programs are paid differently. Agents are said to earn between $9/hour and $20/hour depending on the program you are contracted under. Your income will be based the programs you do and how many hours you work. Most programs pay on a per-minute basis and offer incentives. Direct deposit, or checks by mail are offered as forms of payment. Checks are issued on a biweekly basis to those agents that have completed their work invoices. One testimonial found on Glassdoor.com came from an agent who said, “I enjoyed being contracted by Working Solutions for about 6 years” and went as far to say, “I did not experience anything negative during the entire time that I was contracted by them”. Many of the reviews on Glassdoor are similar- people who have worked for the company for multiple years and couldn’t find a single negative thing to report. With over 100 reviews, the company currently has a 4.1/5 star rating by current/former agents. The negative responses are generally people who find the minimum weekly hour requirement to be too high and doesn’t fit their needs. Overall- this is a great place to begin your work at home career as a home based call center agent! apologize for the confusion and will be in touch as soon as possible. But I was in the middle of the tests to begin with! So, if this comment makes no sense, trust me, I don’t understand what’s happened either. It’s like I was cut off during the application process. But that was a cryptic response I got. Advice? It’s good that you contacted them. I’ve applied to a lot of places that lead me through a string of confusion that seemed to end nowhere. Most likely, they are now aware of the problem on their end. I know they have been undergoing changes. Maybe if you don’t hear back about any openings in the near future, you could email the same person again to check up on things and make sure they received your full application? They never have any available job openings. You will get turned every time you apple for a program opportunity. Good luck! They never have anything available/open and they have been losing a lot of contracts. I would look elsewhere. I haven’t logged onto their site in three months.